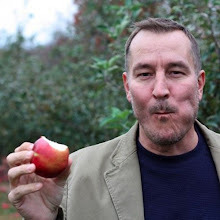 I am going to let you in on a little something — I love to cook — no surprise there right? Well when you cook as much as I do, you get leftovers and I am admittedly not a very good leftover person. I love it the first time but the second time around you either have to change it or Mary has to finish it. I recently made a Mushroom Red Wine Risotto for my latest guest post on Aftertaste on Lot18, which produced quite the amount of leftovers.What to do? 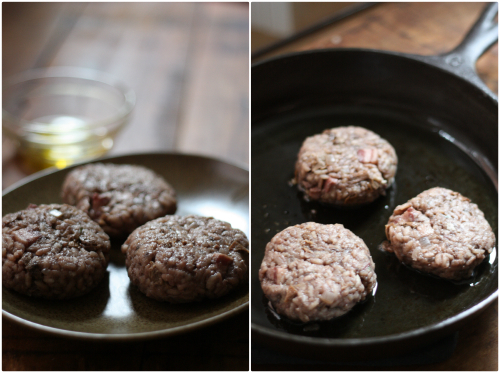 Scanning the web (well Pinterest) we came across risotto cakes that can be fried as leftovers — what a wonderful idea! 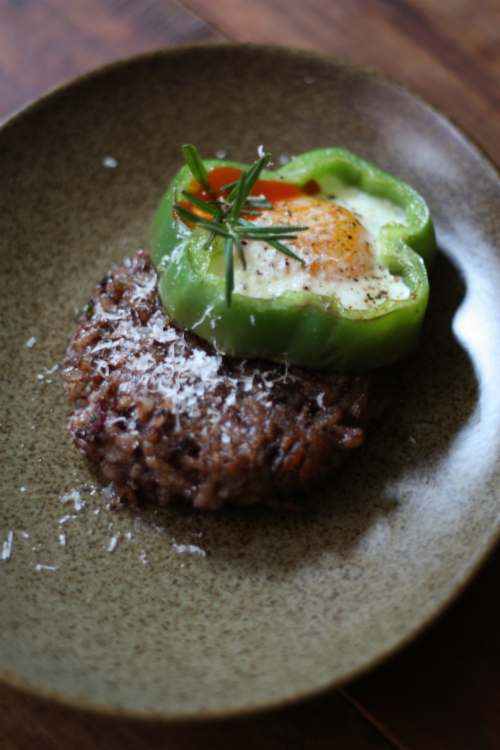 So the next morning the risotto came out of the fridge and the patties were made, but what made this leftover breakfast really different was how served it with an egg fried inside a green pepper nest of sorts. We had just gotten several green peppers and decided to combine them with the risotto and egg. Really quite simple (and ingenious). 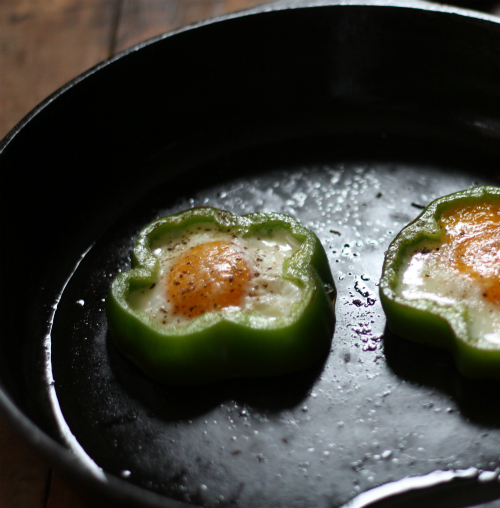 After frying the risotto patties we fried the egg inside the green pepper ring and served each side by side with a dash of KimKim sauce for added zest. It really was a wonderful way to use up some leftovers and at the same time create a quite tasty breakfast. How well are you at using up leftovers and what is your favorite leftover meal that has made a transition from what it was originally intended to be? I am ok at using up leftovers--because I usually plan to eat them as-is for breakfast or lunch the next day. I'll definitely eat leftover pasta, enchiladas, grains and stir-fry or sauce, and I'd have no problem just eating risotto cold out of the fridge! However, I have also made risotto cakes and found them great. 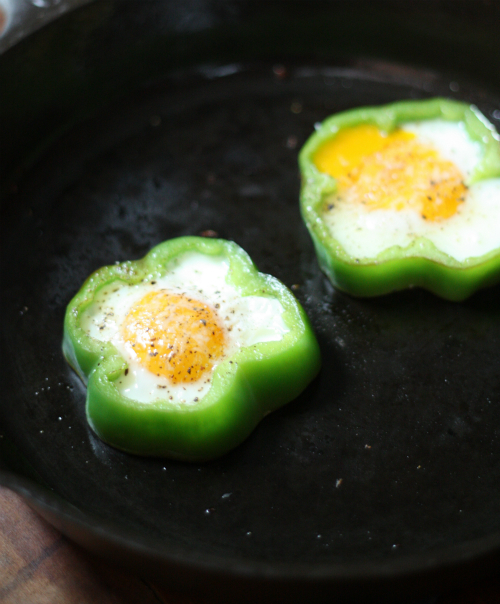 I love the egg in a pepper nest accompaniment! 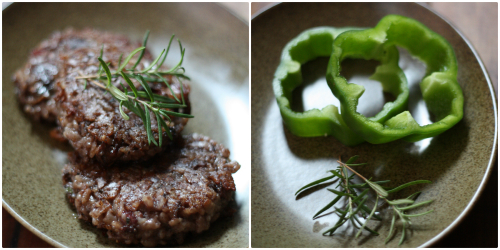 I actually had never done the risotto cakes but will definitely do them again. I am now craving an enchilada! 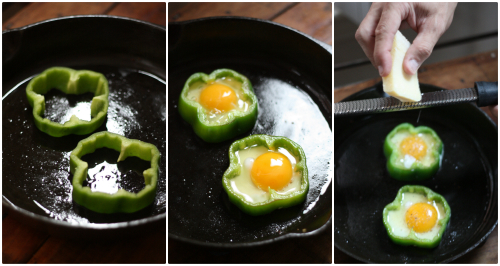 So pretty your pepper eggs nests - may I copy? Of course and I am sure it will turn out beautifully! Great! Let me know how it turns out and thanks for stopping by!